Man's vast creativity and capability to spin a tale or unveil a mystery is just another part of how humans are created in the image of God. He is the master storyteller, weaving a thousand story lines together over the course of 66 books and many centuries. As a writer, this just made my day. It confirmed my belief that creating worlds and people is Godlike—just as Godlike as healing the sick, judging the accused, ruling the nation. Just as Godlike as loving the unloved and unloveable, having mercy, understanding the misunderstood. We have these abilities because God has these abilities to a degree far higher than we can possibly imagine. Doctors know about the human body only a miniscule portion of what the Creator of that body knows, but God shared His knowledge with them in order that they may heal others. Righteous judges can make righteous judgments based upon the wisdom the wisest Judge provides them. And so on throughout my examples: We can do what we do because He does it. He does in purity and perfection what we, in our humanness, tend to pervert, but still, we obtain our ability to do it at all because we are made in His image. We can create and write and bring people to laughter or tears, joy or shame, because He gave us a tiny part of the creativity He possesses. Because we are made in His image, we are able to do to a minute degree what He does in an infinite degree. We are not gods and we certainly aren't anywhere near God, but because we are created in His image, we have His qualities in us. Just think about it—the Creator/Possessor of Heaven and Earth gave His creative abilities to us. Be encouraged in the knowledge that you were created in His image. Have you had a special experience when it was driven home to you that what you created was God-inspired, that He pretty much used your fingers to type the story? 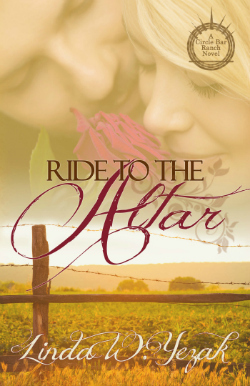 Though we don't do giveaways on Seriously Write, Linda wanted you to know she's running a special giveaway during her blog tour for Ride to the Altar. When you comment on any of the blogs in her tour, your name goes into a (figurative) cowboy hat in a drawing for the items in the photo: "a signed print version of the series, a 16-ounce Christian cowboy mug, a horseshoe picture frame, a Ph. 4:13 stretch bracelet, a cute set of magnetic page markers, and a Texas Rubiks cube." Tomorrow (7/26), she'll be visiting with Linda Glaz. Linda W. Yezak lives with her husband and their funky feline, PB, in a forest in deep East Texas, where tall tales abound and exaggeration is an art form. She has a deep and abiding love for her Lord, her family, and salted caramel. And coffee—with a caramel creamer. 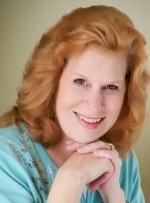 Author of award-winning books and short stories, she didn't begin writing professionally until she turned fifty. Taking on a new career every half century is a good thing. I'm thrilled over whatever creativity God has given me. I always say that God spit out The Yuletide Angel, my first published book. By that, I mean that the story came so fast, so clear that it was like all I needed to do was take dictation. That's the way I feel about Ice Melts in Spring, which releases in A Southern Season in November. Still amazed by that novella. Linda, I agree completely. I feel like the "need" I feel to write--and that so many other Christian writers have expressed--is similar to the hole God created in us that only His spirit can fill. Writing fills our need to create the stories He gives us. What a lovely way to put it. Yes! 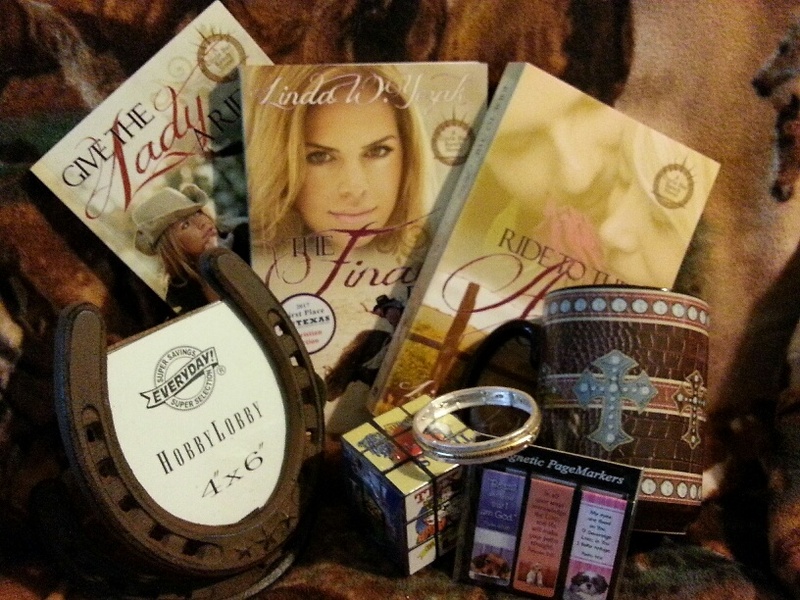 Linda, thank you so much for this post! i've often thought the same thing - then wondered if i was bordering on blasphemy!!! but i've also learned that my writing is [a form of] worship - He told me several years ago that just as a tree "worships" be *being* a tree, i (we) as (a) writer(s) worship by, well, writing!! Linda, excellent post. The DVDs to The Patriarch's was just donated to our church library. I'll have to check them out.